Dishwashers have a filter at the base of the machine. 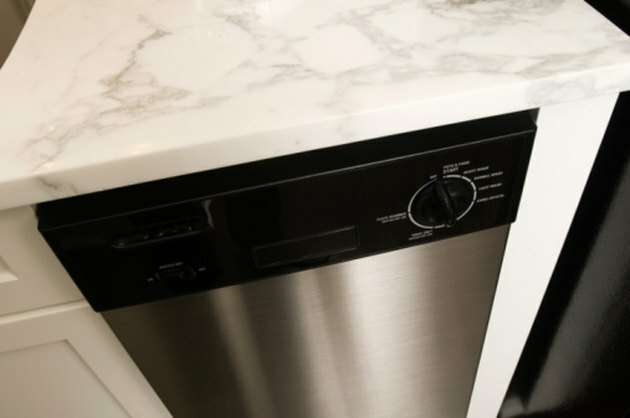 As the dishwasher rinses the dishes, water drains down through the filter. The filter has small holes that catch larger particles of food to prevent the drain from clogging. To prevent the filter from overfilling and stopping the flow of water to the drain, the filter needs to be removed from the rest of the pump unit and rinsed in the sink. Although most dishwasher filters are removed in the same way, check your owner's manual for specifics for your dishwasher. The filter in a dishwasher will often clog. Shut off power to the dishwasher. Open the door and inspect the inside for the filter location. Push at the edge of the main filter to depress the tabs. Pull up on the main filter to remove it. Pull up on the fine filters beneath. Clean the filters out with water and a toothbrush to remove the dirt. Push the filters back into place. Press down to ensure the tabs engage.